Newly hired communications director Anthony Scaramucci addressed the media after press secretary Sean Spicer announced his resignation. Anthony Scaramucci, President Donald Trump's newly named communications director, pushed back against reports of tension between him and some of Trump's top staffers. "If teammates don't have disagreements about certain things, then they're not going to get to the championship. You've got to get together and mix it up from time to time. I have no problem mixing it up with these guys. I love these guys. I respect these guys," Scaramucci said in the first on-camera White House press briefing since June 29. Reports following Scaramucci's hiring Friday indicated chief of staff Reince Priebus and chief strategist Steve Bannon fought to try to keep Scaramucci out of the White House. Scaramucci said of Priebus: "Reince and I have been personal friends for six years. We are a little bit like brothers, where we rough each other up once in a while." 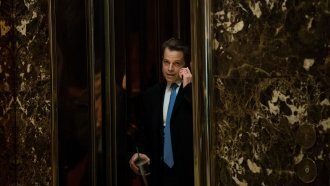 Of Bannon, Scaramucci said: "I've been interviewed about Steve. I think he's one of the smartest people I know. ... He's got a strong personality. I've got a strong personality." Shortly after the businessman was named to the post, press secretary Sean Spicer resigned. Spicer told several outlets he wanted to give the administration a "clean slate." But reports citing unnamed sources said Spicer disagreed with Scaramucci's hiring. For his part, Scaramucci praised Spicer's efforts over the past six months. "I would love to have Sean here," Scaramucci said. "His attitude is, 'Anthony's coming in. Let me clear the slate for Anthony.' And I do appreciate that about Sean and I love him for it. But I don't have any friction with Sean." Trump said in a written statement: "I am grateful for Sean's work on behalf of the administration and the American people. I wish him continued success as he moves on to pursue other opportunities. Just look at his great television ratings." Spicer will remain on the team through August. His deputy, Sarah Huckabee Sanders, has been named press secretary. Scaramucci said he won't officially start in his new position for several weeks in order to make sure his conflicts of interest are "100% totally cleansed." He also said he has been in touch with the Office of Government Ethics. Once he is in the position, Scaramucci said he plans to improve the White House's messaging. Scaramucci said: "The ship is going in the right direction. I think we've got to just radio signal the direction very, very clearly."